Last week, author Stephanie Verni challenged five authors to share five reasons why we write. That was a really good challenge--it took me a week to decide on my top five! I almost always have a blank book going where I can jot down anything that crosses my mind. Some years of my life are pretty well-recorded with diary entries for every week, if not every day. Other years, my blank books are mostly a collection of doodles, story ideas, dreams I want to remember, and other bits and pieces of my life. Occasionally I go back and read through these books, either to remember some real detail of my own life or to dig up an old story idea--both are equally likely. For the same reason, I keep all the old drafts of my books (Just to give you an idea of how much paperwork that is, I have nine drafts of the book I'm working on currently, plus notes). I reference these old drafts all the time, just in case I find I've edited out some character background or something like that. It's fun to see how much the story has changed over time, too! Sometimes I think my books know more about me than I do. I may think that I know how I feel about a certain issue, like healthcare, or criminal justice, or even just small-town politics. Then I decide to write about it and I realize how much I really don't know. By the time I finish doing my research, I can guarantee I've learned something. By the time I complete the final draft, I've learned a lot! One interesting consequence of writing the Time Wrecker Trilogy has been learning more about a variety of issues. For example, I hadn't spent nearly enough time considering how criminal justice really works in America. I hadn't thought as much about the concept of healing before, either, both from intended and unintended injuries. I'm curious to see how I'll feel about these issues by the time I'm done writing the third book! I've dabbled in just about every creative hobby out there: music, sewing, paper crafts, crochet, baking...but I always come back to writing. There is something in me that needs to create. I can hold it over by doing little projects around the house, like cooking dinner or practicing the piano. But eventually, I'll need to sit down and carve out time just to be creative. I love working as a freelance writer because it allows me to fill that creative need so often, but I balance it with fiction writing, too. Of all the ways to be creative, writing is the one that suits me best. 5. I have to write. There's an idea that just won't let go. This is my very favorite reason to write. Sometimes I'll have a story idea percolating in the back of my mind for months (or years...) and then suddenly it becomes a story I have to tell. That's the really fun part, when I'm racing to my notebook or my computer to write down some little scene I just imagined, or I'll be driving and suddenly figure out a plot twist. If I had to pick one reason why I write, this would be it. I know the story is already there: I just have to write it down. 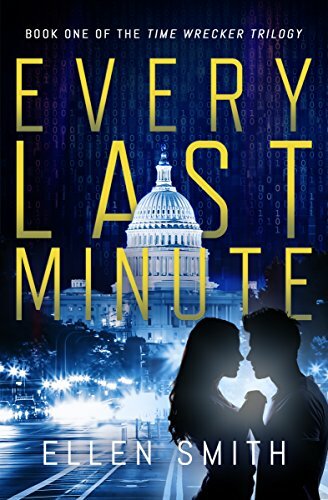 Today is the official release day for Every Last Minute, the first book in my Time Wrecker Trilogy. I am so excited to share this story with you--especially since it's taken twelve years to write! Back in 2005 (when I was first dating the man that is now my husband! ), there was a country music song I really looked forward to hearing on the radio: Bless the Broken Road by Rascal Flatts. So twelve years ago, I would be singing along whenever this song came on. I'm a romantic at heart and I had just met the man of my dreams, so I liked the idea that all the bad things in my past had really just been working together to bring me to this wonderful, happy place in my life. But at the same time, I've always had a relentlessly practical nature. Even while the song was still playing, these little what-if questions would pop into my mind. What if a couple's love story really did hinge on the terrible, even traumatic events in their pasts? Or what if it didn't? What if the couple would have met anyway through Fate, or Destiny, or Ridiculously Good Luck, and they really didn't have to go through that "broken road" to get to each other? How would they even know, either way? The past can't be changed, so why not assume it all worked out for the best? But...what if the past COULD be changed? Over the next five years, these what-ifs became the seeds of a story. Very slowly, the idea started to take shape. I wanted to write about a husband and wife that had been brought together by traumatic circumstances. If they had the chance to go back and change the past, would they take it? Then, in 2010, another country music artist released a song with a similar theme: This by Darius Rucker. Listening to this song brought the idea to the forefront of my mind. I couldn't stand just thinking about this story anymore: I had to try and write it down. My first attempt at writing it took over a year. I revised and edited it several times, but in the end, I knew my story just wasn't ready. I put it aside and wrote and published another book instead. Then in 2015, with encouragement from a good friend, I finally picked up the story again and started rewriting it from the beginning. This time, the characters took shape, the plot came together, and my original story grew from one book to three. As you can see, it took twelve years of stops and starts before that first glimmer of an idea finally became Every Last Minute--Book 1 of the Time Wrecker Trilogy. I guess you could describe the writing process as a long and broken road. Every Last Minute officially releases today! I'm excited for you to finally meet Will and Mara Sterling: a husband and wife with an improbable love facing an impossible choice. One thing I love about the work-from-home life is how writing has become such a natural part of my daily routine. Although I schedule blocks of time for my freelance work, I can also squeeze in plenty of time for my fiction writing throughout the day. For example, it's easy to sit down to work on a draft while I'm waiting for the laundry to finish up or jot down notes on my story while I'm fixing dinner. I spend plenty of time working on my story at night, when the rest of the household has gone off to bed. What would it be like to spend a day (or two!) devoted only to fiction writing? Over the weekend, I got to experience just that on my first writer's retreat. A group of three other writers and I rented out the third floor of the fabulous Frederick Inn Bed and Breakfast in Buckeystown, Maryland. Buckeystown is just 40 miles outside of Washington, D.C., but it feels like an entirely different world. The small town setting and peaceful green spaces made the perfect escape for four writers who needed to quiet their minds and get down to work. And work we did. The inn's third floor had four bedrooms surrounding a common area with a kitchenette, living room, and table. We set up our laptops around the table and started writing within minutes of our arrival. When we needed a break, a quick walk through Buckeystown was a great way to get moving again! Then it was back to the real business of the day: writing. All of us brought snacks and meals from home so we wouldn't have to go out to eat--although I was pretty tempted to spring for dinner at Alexanders! In the morning, the innkeepers, Pat and Kirk, cooked a fantastic breakfast for us. The zucchini quiche was my favorite! Pat and Kirk were so much fun to talk to--they really went above and beyond to make our stay extra special! Now that I've experienced how inspiring a writer's retreat can be, I definitely want to do it again! Huge thanks to Pat and Kirk and the Frederick Inn Bed and Breakfast for this fantastic experience! In my left-brained writing life as a freelance education writer, I spend a lot of time thinking about lifelong learning. That's a big buzzword for educators these days. We all want students to be critical thinkers, studious researchers, and innovative problem-solvers long after graduation. But what does lifelong learning really look like? It's been almost nine years since I left graduate school, which means it's been a long time since I had a professor to give me assigned readings or challenge my thinking. I've been self-employed as a freelancer for four years, which means I've been responsible for my own market research and professional development for a while, too. On top of that, my right-brained fiction writing would be impossible if I didn't intentionally seek out creative inspiration and growth. Being a lifelong learner is synonymous with living a creative lifestyle. One of my favorite resources for lifelong learning is TED. This non-profit has one simple goal: to spread great ideas. TED talks--in which thought leaders deliver short, powerful speeches--are available for free on their website. With over 2,000 talks on a range of topics, it's pretty much impossible to visit their website without learning something new. Since I'm a writer, I spend a lot of time looking for the talks about imagination and creativity. I love hearing what artists of all kinds have to say: what drives them, what humbles them, what inspires them. Here are four of my favorite TED talks that will spark your creativity, every time. Willard Wigan's sculptures are so small you can only see them under a microscope! In this talk, he shows slides of a house he built on the head of a pin, the Incredible Hulk bursting through the eye of a needle, and a microscopic Statue of Liberty (complete with a flame at the end of the torch). Listen to find out about the inspiration behind his work. I guarantee his speech will make you rethink what it means to pay attention to detail. One of my all-time favorite TV shows is Project Runway--I've watched all 15 seasons and I can't wait for the next! Since fashion designer Isaac Mizrahi is a judge on the show, I had to see his TED talk on fashion and creativity. Although I think of him as a designer, it surprised me to learn that Mizrahi has many, many interests and draws creative inspiration from just about everything. His speech is a great reminder to try new things in the quest to "not be bored." Ji-Hae Park is an incredible violinist, so listening to her TED talk is worthwhile just for the chance to hear her play. However, as Park says during the talk, music is about so much more than being successful or accomplished. Her speech and performance captures why it matters to be creative just for the sheer joy of it. This speech was recorded after the publication of Eat, Pray, Love, when Elizabeth Gilbert had achieved wild success as an author and was at work on her next book. I love her perspective on the social pressure to "be a genius," and her smart and funny discussion of what it means to "have a genius" instead. There are thousands more TED talks on the TED.com website--don't be surprised if you want to spend all day listening to them! Do you have a favorite TED talk? Share it in the comments--lifelong learning is all about spreading great ideas! There are some points in our lives where our usual language is lost to us. These times aren't necessarily sad--it's also possible to be so happy, so in love, or so grateful that we can't find the words to express ourselves. When words fail, I've always turned to music. Some songs capture a moment or a feeling better than a thousand novels ever could. One of these songs is Leonard Cohen's Hallelujah. For me, Hallelujah represents pure, raw humanity. It's about David and Samson and it's just as much about us--the "real" people who feel lost and divine and broken and holy all at once. It takes these heroes from the Bible off of their pedestals and puts them here with us in the everyday. I've listened to this song many times since last Thursday, when I heard the news that Leonard Cohen had passed away at the age of 82. As a composer, musician, novelist, and poet, Cohen often explored themes that you hear in Hallelujah--spirituality, love, loss, brokenness, and healing. His music has offered me a place to reflect, rest, and rejoice, even at times when I wasn't able to put words to those feelings myself. For all of us creatives, this is why we do what we do. This is why, when we finally finish writing or composing or painting, we're not going to keep our work to ourselves. We're going to share it. Maybe we'll get the big publishing contract or the record deal, maybe we'll go for the smaller label, maybe we'll go indie or even share it for free. But it's so important that we do share what we create, because someone, somewhere, needs to hear it. It might not be someone we know now, it might not be someone we ever meet, but there is someone out there who needs our work. When words fail, there is always music. I'm so grateful to Leonard Cohen for being the artist that he was, for sharing his gifts with us, and for giving a voice to all of us who are working to find ours. Thank you, Mr. Cohen. Rest in peace. If that sight isn't terrifying, I don't know what is. The most intimidating thing about a blank page is that the longer I stare at it, the harder it is to start writing. It starts to feel like writing the wrong word is even worse than writing nothing at all. If I'm just a little stuck, pushing through and freewriting can help get the words flowing again. If I'm really in a rut, though, I need to switch gears completely. My favorite way to recharge is to put down my pen and head for the piano. What I love about music is that it's a zero-pressure creative escape for me. At this point in my life, there's no piece to learn for music class, no recital to prepare for, and (thankfully) no audience for the inevitable wrong notes. I'm playing just because it's fun. The most freeing thing about playing piano is that there is no finished product. If I don't get a musical phrase exactly right, there's nothing to go back and edit later. I just play it again until I'm happy. That's especially satisfying since so much of my creative work is about results. Whether I'm working on a freelance project or a novel, my ultimate goal is to have a finished piece that's ready to send off into the world. With music, my only goal is to relax and enjoy the process, wrong notes and all. After a little time on the piano, it's easier to go back to writing and stare down that blank page. I might start off with the wrong word. I might even write whole chapters that don't work or a story that goes nowhere. That's okay. If I just keep writing, I know I'll eventually get to a place where everything sounds exactly right. As Dilbert-creator Scott Adams said, "Creativity is allowing yourself to make mistakes. Art is knowing which ones to keep." Inspiration: Kurt Vonnegut's "Shapes of Stories." Kurt Vonnegut, author of Slaughterhouse-Five, said in his autobiography that his "prettiest contribution to culture" was his rejected master's thesis on the shapes of stories. I like that the story shapes for the first and third books are roughly the same. The second book, as I was hoping it would, has a distinctly different shape from the other two. One of the hard parts about planning this series has been ensuring that the overall story arc for the trilogy has a nice flow to it. After this little exercise, I feel like I'm on the right track! What do you think of Vonnegut's theory? Have you ever drawn out the "shape" of a story you're working on? © 2017 Ellen Smith Writes. All Rights Reserved.